It’s important that you have experience in jumping for at least a year before you can start to train your horse to jump. Practice on an experienced jumper first so you can get the hang of it. There are a lot of skills you’ll need to learn, such as maintaining the two-point seat without sitting, maneuvering a low-grid row without reins, etc. The most vital skill you need for jumping is to develop a secure seat, regardless of your horse’s gait. It would be a good idea to work with an instructor or a coach to help you with this. A secure seat will improve your safety and comfort during horse jumping. You must never jump with a “cold” horse, as it could result in injuries for the horse and accidents for you. Horses are prone to experiencing slips, falls, tendon injuries, etc. when they jump before getting warmed up. Make sure you start out with a good warm-up that lasts for at least 30 minutes before you start the training. You can also give your horse muscle strengthening supplements to boost muscle mass and prepare them to jump confidently. Successful horse jumping requires a good relationship between horse and rider. For your horse to gain confidence in jumping, it needs to trust you as a rider. Keep your contact soft and try slipping a couple of fingers in your horse’s neck strap instead of catching it in the mouth. You should calm your nerves as well because the horse can sense it when a rider is anxious, and that may irritate them. It’s vital that your horse’s stress level is as low as possible. Eliminate any elements that could cause your horse to become nervous – such as loud noises, unusual objects, etc. And try to introduce positive reinforcement if you think it will help. If your horse is food motivated, for instance, you could reward them with a treat after they complete a small jump. When training your horse to jump, you need to gradually get them to develop confidence in the activity. You can start out by training them to trot over a single pole, and then move on to a line of poles. Once they get comfortable with this, you can introduce the cavalletti along with small jumps before even attempting high jumping. You can increase the level of difficulty after the horse can perform jumps properly at lower difficulty levels. If you force your horse to do too much too soon, they could end up losing confidence in themselves and their trust in you. You can use colored poles when starting out with your horse jumping training. 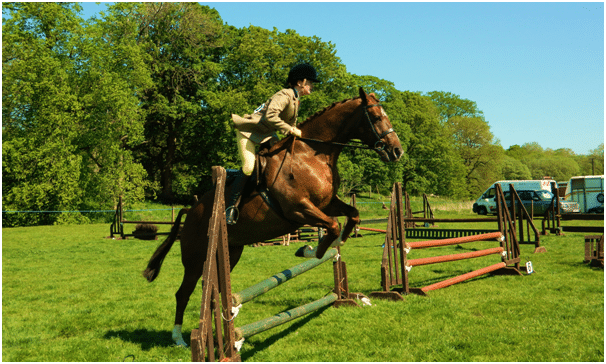 Use a single pole at first and then build up the height as you go so that it suits your horse’s natural stride. Tramlines can help if your horse is lacking straightness. After your horse can confidently negotiate the trotting poles, you can introduce a cross pole. 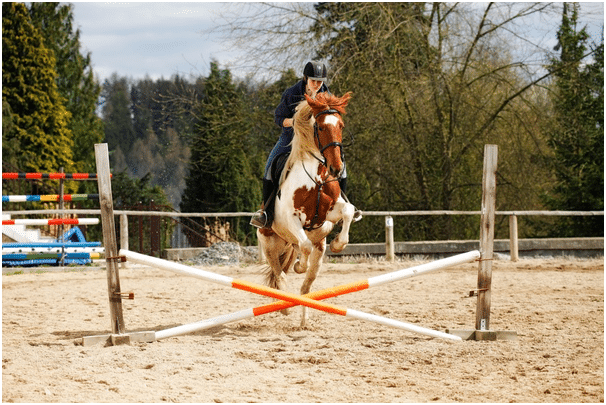 A cross pole will encourage the horse to lift through its shoulder and can make for an excellent step in horse jumping training. But make sure you have take-off rail and a landing rail that will guide the horse on where to put its feet. The cross pole you start with should be very small. And the average distance shouldn’t be more than 2.5m, which you can then increase as the jump gets larger. 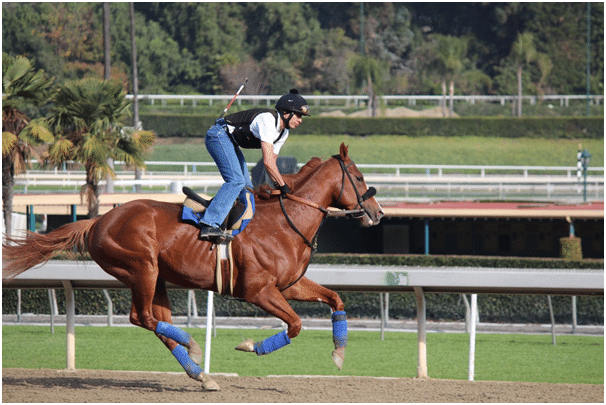 The initial stages of training such as trotting poles, small jumps, and cavaletti require little to no rein contact. This can ensure that your horse gets encouragement to carry itself calmly. Some riders may make the mistake of using strong rein contact for controlling their horse, keep them from stumbling or keep them from rushing. This could defeat your whole purpose, as your horse needs to learn how to carry itself. By maintaining minimal rein contact, you can prepare your horse not to be frightened because you’re not holding it. This can help your horse learn how to handle itself even in case you lose a stirrup or a rein over a jump. Free riding and free jumping in an enclosed area can be very effective to achieve this goal. Repetition may be the key to ensuring that your horse gains confidence in jumping. However, there can be such a thing as too much. Avoid training your horse to jump every day, as it could get mundane for them, and they could lose their enthusiasm. Additionally, repeating the same steps every day could result in soreness for your horse. Three days of jumping obstacles is more than enough to train your horse to jump. Set aside a couple of days in a week for dressage training to switch things up a bit and prevent your horse from losing enthusiasm. On your days off, you can ride out in the hills so they can feel refreshed and gear up for more training. These are some of the most effective steps that you can take if you wish to train your horse to jump or improve the way they jump. Remember not to rush things, and give your horse sufficient time to develop confidence in different activities. And don’t forget that horses can get bored, just like humans. So it’s important to vary their training every now and then instead of making them stick to the same old training routine throughout the week. If you need any more tips on horse jumping training, feel free to get in touch with us.